Luxury is something that most of us look for which isn’t always easy to find. If this is what you are searching for then Decor8 Hong Kong furniture maybe able to help. In today’s entry we’ll focus on lighting and today’s spotlight goes to the Seashell Retro Ceiling Lamp. Living by the seaside is a luxury that not everyone can afford but that doesn’t matter if you can get something inspired with a seaside theme. The Seashell Retro Ceiling Lamp is a Mid Century European style ceiling pendant lamp. 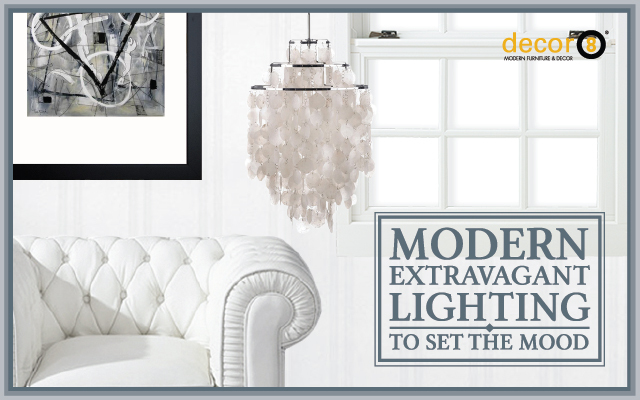 This modern extravagant lighting can be used to set the mood when you place a warm yellow ambient bulb in the fixture. This is perfect to set the warm romantic mood for your interior whether you want to create an extravagant atmosphere in the eatery establishment, living room, dining rooms, or in the hallway. You could even place a couple of these fixtures in the same room to help you evenly distribute light into the space. Perhaps you have a large dining table then you could place two over the top of it to add more light into the area. The fixture of the Seashell Ceiling Lamp is supported with a steel frame with columns of the seashells linked together. An added bonus to this lamp is that it gives off a majestic look and even a chime when a breeze blows onto the fixture. Wondering what bulb the Seashell Ceiling Lamp takes? This fixture accepts E27 light bulbs and which bulb you decide is up to you. You could go for a while light with energy savers and LEDs or go for a warmer yellow glow with fluorescent industrial bulbs. Interested in this seashell lighting? Come into our Wan Chai showroom to check it out with your very own eyes. Witness the beauty that this lighting has to offer with the rainbow effect gleaming off the seashells. Don’t be shy and come on in to check it out! This entry was posted in Ceiling Lights, Pendants, Chandeliers, Lighting and tagged bright, ceiling lights, decor8 lighting, extravagant lighting, fancy, hong kong lighting, lighting, lighting hong kong, modern design, pendant lights, stylish light.